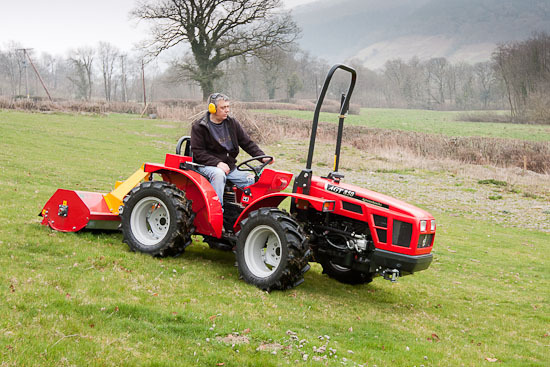 Having bought the right tractor (AGT 850) to work on our steep slopes it was necessary to get a mower/topper to deal with the overgrown grass, bracken and rushes on the land. At this stage things are not too bad, but the land has been let go for a while and if not tackled soon the pasture will start reverting to being overgrown with bracken and scrub etc.. I settled on an INO flail mower which are made in Slovenia by a company that has been going for 20 years or so (they are also rebadged by other manufacturers in the UK and sold under their own trade names). I purchased it directly from the importers (Willow Farm Machinery) who shipped it by carrier. Unfortunately the carrier’s lorry was too large to get down our lane! After some lateral thinking the driver delivered to a nearby agricultural dealer who kindly brought it here on a trailer for a small reward (drink!). After hitching up to the AGT I had to cut down the PTO shaft which was too long; greased the bearings and off I went. We have had a particularly dry spell which is ideal (as working on our slopes in the wet could be suicidal!). The tractor and mower coped admirably on even the steepest bits. However, turning at the top of the steepest slopes looked a tad dangerous – so I dealt with these by reversing up and then mowing coming down. I did notice one or two local farmers slowing down on the road below to see what I was up to; most seem quite intrigued to see an Alpine tractor rather than a traditional tractor! Once all the land has been topped (I didn’t get it all finished due to it turning wet) I shall use some Asulox spray to treat the worst areas of bracken as they start to regrow and probably also spray some of the rushes with Headland Polo. Once this has been done (perhaps a couple of times) I should not need to use chemicals much with an annual top with the flail keeping things under control. Congratulations for getting retired and moving into the countryside. And of course, I am glad that you decided to buy our flail mower MMT. Just grease it and check for the bolts and nuts and it will serve you well. I wish you many nice days spent in nature. Is this the last post about your alpine tractor? I am thinking if AGT is any good and from your first post about the tractor I read you have plans to write more about reliability etc but can not find any more posts about that? Yes it is the last post about the AGT and I should really write a follow up. To answer your question the AGT has been fairly reliable so far; a few minor niggles including the exhaust bracket breaking (simple welding job) and a hydraulic solenoid needed replacing (but this was fitted on ordering by the dealer so not really an AGT issue). Otherwise all OK so far.